industrial food system | Laura's "Rules"
Sometimes trivial events are telling. I went looking for Lincoln Logs for Maya a little while ago, only to find that they are now not logs at all, but instead sad, cardboard-and-plastic affairs, with only the flimsiest relationship to the simple wooden toys of my childhood. But the truth of what’s happened to the building blocks of our lives is far sadder than that. We make our consumption choices inside the bubble of a globalized, mass culture, on a steroid dose of marketing, with much of the information about how things are made and what they really cost us surgically removed. We can watch a video about “gangnam style” from the other side of the planet, and be exhilarated by vast quantities of information on the Interwebs and our fast life on an information highway, yet, curiously, we have no idea where most of the stuff around us comes from. In fact, we have been carefully taught to screen out the material of our immediate world, to focus on whatever problem is assigned to us and nothing else. When we go to work, do we ask why the coffee is not organic or fair trade, or where the desks and carpets and chairs came from and what’s in them? Of course we don’t. If we go to some affair by a well-meaning charity, and the hors d’oeuvres are being passed, do we stop someone to inquire where the salmon is from, or whether the waitstaff is unionized? No, of course not. We look past the moment and write a check for social change. This is no accident, of course. We are afraid of bringing on a confrontation, of making a fuss or asking too much. And the very purpose of the system is to keep us distracted and in the dark. Of course, there are notable and note-worthy exceptions. Students who noticed that they no longer wanted sweatshops making their university garb organized and made real progress in building a fair trade alternative. Organic foods were scarce only a decade ago and now can be found in nearly any real store. There are burgeoning movements about a new ruralism and biodynamic farming, about minimalism in consumption, and a new attention to DIY and upcycling, to slowness and conscientious choice. These healthier signs notwithstanding, I don’t think it’s mere nostalgia about a more authentic past to suggest that we are living, today, inside an ersatz construction. Inside this simulacrum, we eat food, only to find out that it is mostly from a laboratory, rife with chemicals, gums and cheap substitutions, or from an industrial farm, and loaded with antibiotics, growth hormones, and cruelty to both farmworkers and animals. Even healthy food can now evidently be defined, as in a hotly contested government report, as containing only 50 percent of something recognizable as food (the agribusiness complex argued 50 percent was too high! In food for children!). We buy furniture made mostly of pressboard and glue from someplace like Office Depot or Ikea, built for obsolescence and destined for a landfill rather than re-use. In fact, as you may have noticed, should some part arrive damaged, the company will ship you a whole new version of the item and won’t even bother to pick the faulty piece up — because while these items are costly, they are without any real value. Our ‘tweens make “haul” videos of their most newly acquired pile of “fast fashion” clothes, constructed to last one season, and made somewhere else by people working (and sometimes dying) in deplorable, dangerous conditions, by suppliers that pollute the local waterways with toxic dyes and other chemicals. 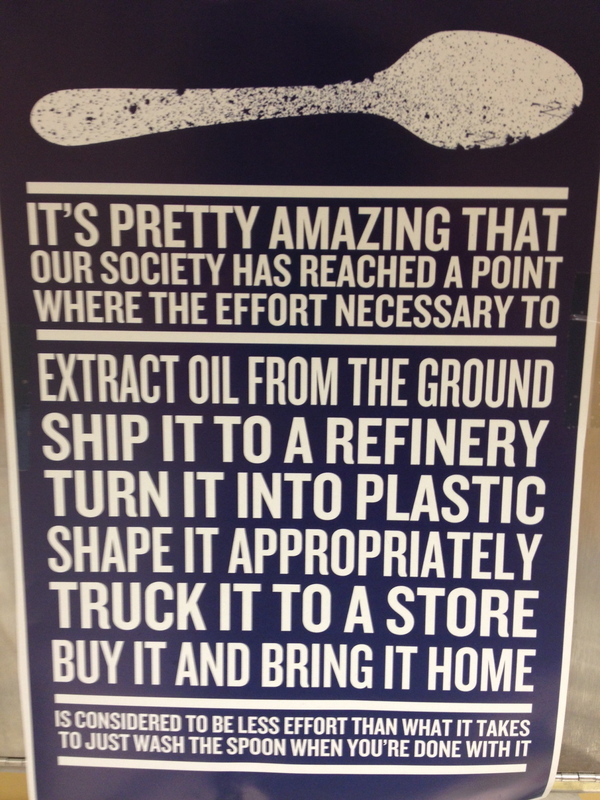 All of our plastics, as well as many of the chemicals and even some food additives, are actually byproducts of the petrochemical industry, thus making us pay them for the privilege of treating our bodies (and oceans) like oil company disposal facilities. In sum, there has been an unmistakeable and steady hollowing of our lives. While the things around us look, more or less, the same as they did for our parents, with updated styling, there is far less to them in many ways — less wood, less actual food, less intention and care — and far more miles and sleight-of-hand. The new equation combines the sped-up pace of global capital and the push to find a penny — or a fraction of a penny — from some new process, waste material or lab invention with ready markets ripe for exploitation in parts of the world that lack environmental and labor standards. We are then offered its glittering products, free of worldly taint or complex information. This is what the market wants, we are told. It’s convenient, modern, helpful — even necessary. But is it really what we want? To be rather numb to the world immediately around us? To have the suffering of strangers quietly but insistently on the edge of our consciousness? To live inside the choices corporations have already made for us without questioning what other world there could have been? There is, in fact, an alternative, and we already have many of the tools to make it so. We should imagine — and work to bring about — a future of radically unfettered information, and of a particular kind of augmented reality. Think a UPC code on every product, scannable with a smart phone, that brings up the full contents of what a purchase actually means for you and in the world: all of the components, environmental impacts, human health and safety issues, worker safety, life-cycle cradle-to-grave impacts, corporate policies, and even video images of the factory in which something is made, as well as maps of where it came from and how it traveled through space and time to the shelf. Nutritional or other helpful information in context with comparable items (hello, Fooducate), and even the full scoop on what the packaging is made of and its life-cycle. This would help to foster responsibility all the way down the supply chain, and change the fundamentals of our economy to be both healthier and more sustainable. While many consumers may not care about such details, of course, enough would be impacted by the information to make better choices, and perhaps even to agitate for more accountable corporate and government policies. The agribusiness industry has fought labeling for genetically modified foods and country-of-origin labels tooth and nail for years out of just such a fear: the fear that consumers will care. And corporations would have to compete in a world of information equality. With supply chains exposed, the quality of their goods and the ways in which they were made would be the distinguishing factors. Governments, which seem so sadly behind the pace of change and the risks, and too often end up being the keepers of corporations’ secrets thanks to outmoded policies on confidential information, could enforce existing rules far easier and dream of responding to new threats in real time. Despite the fact that we humans have made many of the things now in our lives — we built the buildings, made the appliances, constructed the electronic gizmos and gadgetry — we have no record of what’s in our world. Instead, epidemiologists and allergists and others who study disease go on measuring things like our body burden for toxic chemicals, or the quality and contents of our water or air, and oncologists and other medical specialists go on treating the cancers we get from who-knows-what. To make connections will require rapid advances in both how the body works and what is impacting our health. This is not a medical problem or an environmental problem — it is an information problem. Neither the government’s systems of protections nor the marketplace can function well when the signals about the differences in choices or products are so muddled. Consumers today — even ones trying to do the right thing — have to effectively get a PhD in multiple sciences, read past labels, ignore misleading greenwashing, and keep up with the latest findings from watchdog groups just to figure out which household cleaner won’t hurt their child. Better companies suffer in this environment, as their sacrifices are lost in the noise, and the engine of consumer choice cannot be harnessed as it could be to drive meaningful change. In short, the information revolution must make transparent our lives and choices. People working on access to information and the quality of public information should be working together strategically to dismantle the barriers — including current rules about intellectual property and confidential business information, gag orders and secret settlements in court, and labeling omissions that shield hidden or vague ingredients in products and product packaging. There is a massive agenda here for change, of course. But people working on these issues should knit them powerfully together, in the way that advocates addressing the climate crisis know that they are working on the same issue whether they are combating drilling in the Arctic or local zoning laws. The changes wrought by open information in the political economy — both within companies and in Washington — could be profound. I humbly submit, as one who’s labored in those trenches, that these types of solutions may prove more potent than some classic “good government” proposals. Publishing more details of the appalling record on corporate lobbying, powerful as it is, often triggers cynicism and resignation among voters. It highlights a government that is remote, making decisions on high and impacted by power in ways that ordinary people cannot compete with. And the best campaign finance reforms have, sadly, been taken off-line by recent Supreme Court decisions that crippled critical aspects of their design. If corporations are people for political purposes, as the high Court, in its limited wisdom, has prescribed, well, it seems to me a pity that they now know so much about us while we really know so little of them. Equipping consumers with actionable information on corporate accountability speaks to the choices they make every day. If accompanied by thorough reporting to government bodies, enabling them to form a more complete picture, the impact could be substantial, perhaps even transformative. In the end, what else do we have except for what we do in the world? Making it mean something to us, all the way down, and seeing what it does mean, is a task most worthy of us, our markets, and our public institutions. I’ll be writing more on this subject in the coming months. Please send your ideas for posts on corporate secrecy and public access to information and the nexus to public and environmental health. Sometimes it’s the simplest things. Early last week, Maya had a runny nose and a case of the sniffles. 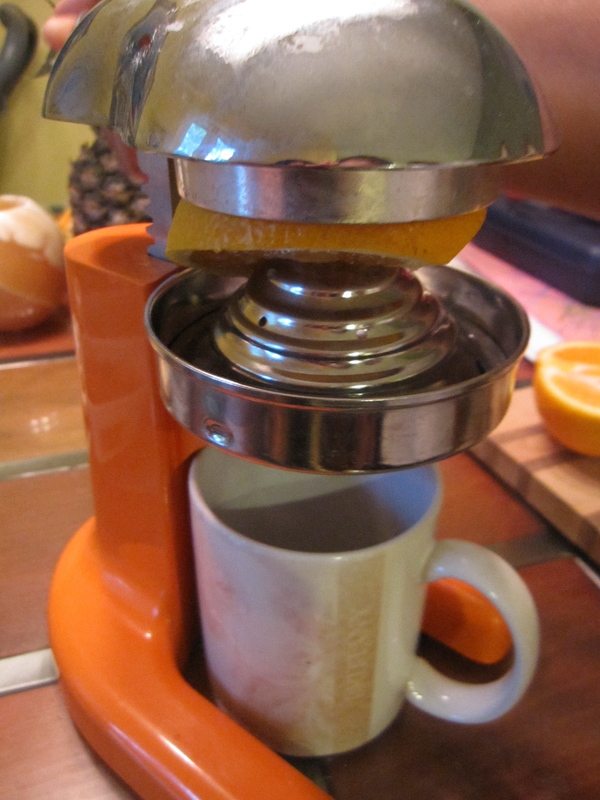 So we bought some fresh (organic) oranges, washed and juiced ’em on our cheap-o hand-levered metal thing-gummy, which works pretty well. 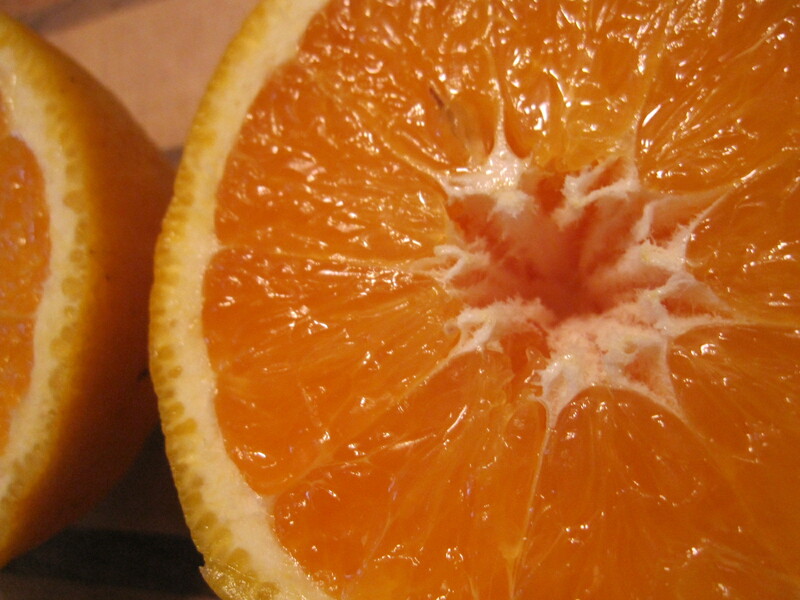 You need about 5 or 6 oranges and 5 spare minutes to fill a coffee mug with fresh, delicious juice. But it’s so worth it. Maya’s sniffles vanished within a day. In fact, the juice was so tasty that it reminded me of a story I saw a year or so back about what, exactly, is in commercial orange juice. Funny thing. 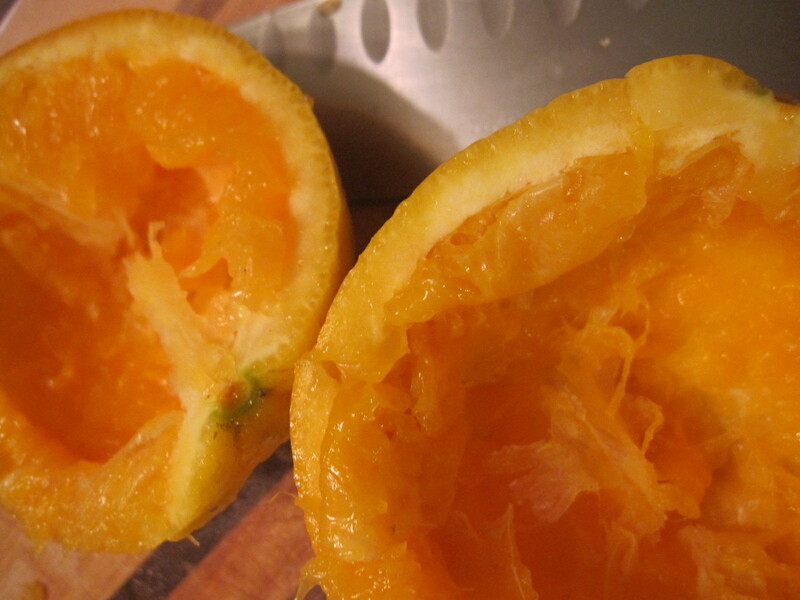 Turns out that oranges aren’t actually hanging on the trees all year long, waiting to be juiced and put into a container lined with a thin layer of plastic known to leach from acidic liquids (yeah, there’s that too — sorry…). In fact, “not from concentrate,” a.k.a pasteurized orange juice, is not more expensive than “from concentrate” because it is closer to fresh squeezed. Rather, it is because storing full strength pasteurized orange juice is more costly and elaborate than storing the space saving concentrate from which “from concentrate” is made. The technology of choice at the moment is aseptic storage, which involves stripping the juice of oxygen, a process known as “deaeration,” so it doesn’t oxidize in the million gallon tanks in which it can be kept for upwards of a year. 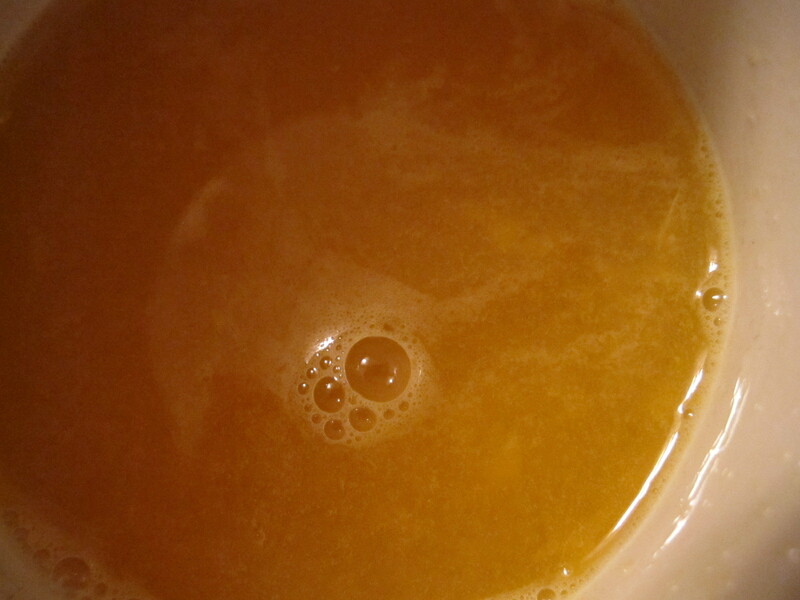 For example, have you noticed that the OJ from MinuteMaid has a signature candy-orange flavor? In the US, manufacturers of these chemical packs emphasize high amounts of ethyl butyrate, a chemical in the fragrance of fresh squeezed orange juice that, juice companies have discovered, Americans favor this because it’s a flavor they associate with fresh, juicy oranges. Yes, well, we’re all fools, really, if we think that the stuff in a box tastes anything like what comes fresh out of a juicer. It’s amazing what a little whiff of an orange-like odor can do to deceive the senses. The FDA, predictably, says all of this is cool, because the flavor packs use essences derived from oranges. But one obvious question seems to be: what happens to the Vitamin C and other nutritional content from this process? Of course, just eating a piece of fruit is the best way to go, because that retains the fiber (and avoids the industrial food labs). When we juice, Maya inevitably asks to munch on slices of oranges. So that’s another, no-duh benefit of slow(er) food, prepared by us, from real ingredients. She makes the connection between the fruit and juice, and pushes the lever herself sometimes (ok, this happened, like, once, but still, it’s a good precedent). I know a lot of kids drink juice all the time, and sure, it’s better than soda. But that’s not saying much — so this is yet another area where, at our house, we’ve decided to channel Nancy Reagan and just say no. It’s really enough to make you fruity. Sniff. Here’s the ABC News coverage of this issue, and here’s a book about OJ and its processing: Squeezed: What You Don’t Know About Orange Juice, by Alissa Hamilton. Read more about natural healing remedies this week on Healthy Child, Healthy World, which is doing a blog round-up just in time for flu season!